Dec. 2, 2018 at 8 p.m. to Dec. 2, 2018 at 11:59 p.m. 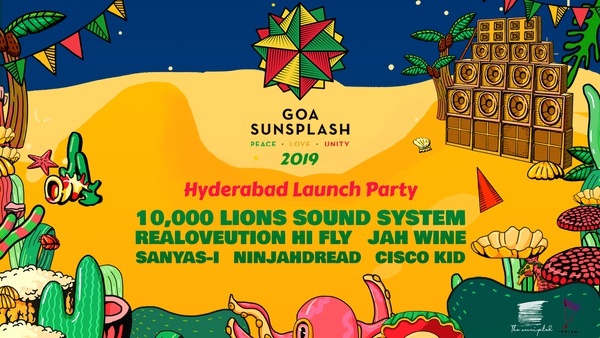 This is the official Hyderabad Launch Party for Goa Sunsplash 2019, India's largest celebration of reggae music and culture. If you love reggae, dancehall and sound system culture in general, this is one event you don't want to miss! We'll be powering up 10,000 Lions Sound System, giving you the unique experience of hearing reggae music as it was meant to be heard, on a hand built Jamaican style sound system. Come and experience the sounds of our international and home grown selectas and MCs. Realoveution Hi Fly, Jah wine, Sanyas-I, Ninjahdread and Cisco Kid will all be there to take you on a musical journey.